Adobe Illustrator has long been considered the only major player in the vector drawing application category, but the Mac-only VectorDesigner is proving to be a worthy competitor for most non-professionals. Get it at MacZOT this weekend (2/7 & 2/8) for 43% off. Before jumping into the VectorDesigner application itself, I figured it might be a good idea to explain what vector art actually is for those who aren’t familiar with it. Most of the images we view on our computers are comprised of tiny blocks called pixels. When a bunch of colored pixels are put together, they end up forming digital photos and graphics as we see them — otherwise known as raster images. The problem with raster images is that quality suffers severely when they are resized, resulting in an ugly boxy mess. The benefit of vector images is that they’re made up of mathematically-generated shapes (with points, lines, curves, etc.) and can be enlarged to almost any size with little to no quality loss. You would generally use software like Adobe Photoshop to work with raster graphics, whereas Adobe Illustrator is built specifically for vector graphics. Those products are the standard for graphics professionals, but what if you just want to create some digital art for a personal project? Illustrator is way too expensive ($599) for most folks and it has a steep learning curve for beginners. 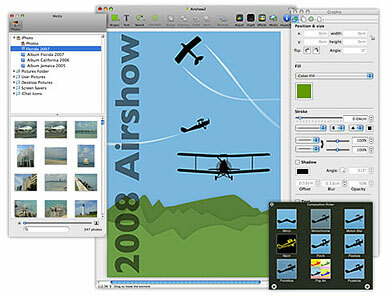 An excellent alternative worth checking out is TweakerSoft’s VectorDesigner ($69.95). VectorDesigner is a vector drawing application developed with the goal of offering as much functionality as possible without sacrificing ease of use. And it does just that. Just about anyone will be able to create vector-based logos, illustrations, or models with ease. Upon launching VectorDesigner for the first time, I was pleasantly surprised by how much it looked like it could be part of Apple’s iWork suite. This is a Mac application through and through, meaning the program’s interface will be both familiar and welcoming to nearly any Mac user regardless of past vector drawing experience. The drawing tools themselves couldn’t be simpler. Users can start with pre-defined shapes like rectangles, ovals, and stars or draw their own custom paths. The Inspector (a frequently-used element in Apple’s own software) is where properties like color, stroke, opacity, shadows, etc. can be modified. Adding and manipulating text is a cinch as well, making it easy to have the words interact with shapes and paths. Even some of the more advanced features like subtracting and intersecting shapes are incredibly easy to figure out. VectorDesigner even outshines Adobe Illustrator in some areas, such as its support for non-destructive Core Image filters and effects. This Mac OS X technology allows you to make significant visual changes to images without altering them in their original form. Other unique features that help separate VectorDesigner from the rest of the pack are iSight camera and iLife media gallery integration. It’s great to see a developer build an application that uses different parts of the Mac experience to its advantage. Flickr has also been built into VectorDesigner, giving users convenient access to a large library of images to use in their projects. Overall, VectorDesigner is a fantastic tool for Mac users who are interested in creating digital art with a simple and intuitive program. While it lacks some advanced features present in Adobe Illustrator and isn’t suited for professional graphic designers, VectorDesigner is an affordable and worthy alternative for just about everyone else. The drawing tools are easy to get a hang of and the software offers just enough power to get the job done without becoming confusing for beginners. Take it for a spin with the 15-day free trial available at TweakerSoft’s website and check out their video tutorials to help minimize the learning curve. You can also buy VectorDesigner for 43% off this weekend (February 7th & 8th) on www.maczot.com. Exports well-known formats like EPS, PSD, PDF, PNG, JPEG, etc. In December 2009, I installed Vectordesigner as a trial to see if I could use it to quickly prototype. The program initially operated as expected. The interface is clean and useful. There are couple of minor quirks, such as what appears to be a useless ‘Pen’ icon in the layers palette that appears to have no affect. You would expect this pen to indicate the item that you are editing, but it has no relationship to editing any object. I used Vectordesigner to design a real logo. I have used the program completely in this function. Starting out everything was cool, but as soon as I placed text on a curve, the program dramatically slowed down. as I added more layers and one other text path, the program became so slow as to wait seconds between operations. Operations that are so basic such as a simple object selection. I decided to install Vectordesigner on a Core2 Duo machine to see if a fast mac would solve the problem. It was a bit faster, but did not resolve this speed issue enough to make the program usable. I wrote Tweekersoft a month ago about this, and have not received a reply. There was a update to the program to version 1.5.2, but interesting that this update made the program even slower. The program looks promising and I had hopes that this would be usable, but sadly the extreme slowness is much too painful to proceed with any use of Vectordesigner. I too downloaded the demo and was initially impressed with the simple but effective interface. However the slow and sluggish pace at which the program operates makes it completely useless.